Deonna Purrazzo teamed with Dakota Kai to face Aliyah and Lacey Evans tonight on NXT. Evans and Deonna started off the match by locking up in the middle of the ring. Purrazzo got the upper-hand and applied a Headlock. Evans escaped and tagged Aliyah into the match. Aliyah knocked Purrazzo to the canvas but Deonna quickly battled back with a kick of her own. Aliyah drove Deonna to the corner and Evans tagged in. Purrazzo went for an Arm Bar but Evans was able to escape before Deonna could lock in the hold. Aliyah tripped up Purrazzo in the corner of the ring and Evans hit her with a Bronco Buster for near fall. Aliyah tagged in and applied an Arm Bar to Purrazzo in the center of the ring. Deonna finally escaped and tagged Dakota Kai into the match. Kai exploded with a few kicks to Aliyah and followed it up with a Facewash for a near fall. Evan’s tagged in as Aliyah bounced off the ropes and leveled Dakota Kai with the Woman’s Right for the pinfall victory. 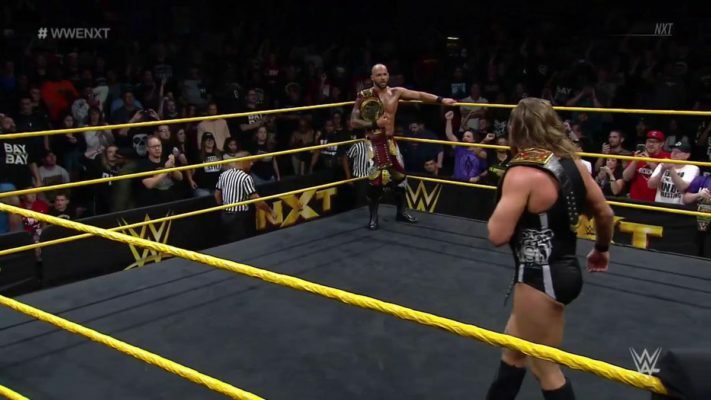 Humberto Carrillo faced Jaxson Ryker from The Forgotten Sons on this week’s episode of NXT. Ryker launched Humberto across the ring to start off the match and then slammed him face first to the canvas. Jaxson stomped on Carrillo in the corner of the ring and drove his face into the canvas several times. Ryker then put Humberto away with an impressive Slingshot Powerbomb for the victory. Pete Dunne and Ricochet put their titles on the line tonight in a champion vs. champion match. Dunne knocked Ricochet to the canvas to start off the match and started bending back his fingers. Ricochet escaped and proceeded to trade submission holds with Dunne for the first few minutes of the match. Dunne connected with an awesome forearm to the face that sent Ricochet to the canvas. Ricochet battled back with a couple of chops to Dunne’s chest and then dropped him to the mat with a Dropkick to the face. Dunne rolled out of the ring to try and regroup but Ricochet hit him with a Suicide Dive on the entrance ramp. Back in the ring, Dunne blocked Ricochet’s attempt at a Hurricanrana and booted him in the face. 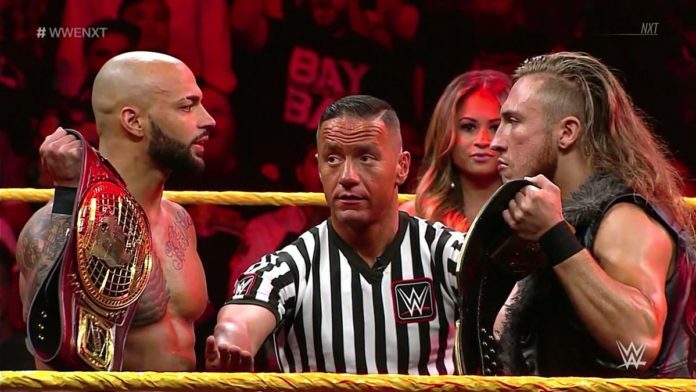 Dunne then started bending back Ricochet’s fingers once again as the crowd chanted “fight forever!”. Ricochet escaped and turned Dunne inside out with a Clothesline. Dunne responded with an Enziguri and went for an X-Plex but Ricochet somehow landed on his feet. Ricochet quickly hit a standing Shooting Star Press for a near fall. Ricochet made his way to the top rope but Dunne dragged him to the mat and locked in an Arm Bar. Ricochet countered into a cover for a two count and then went for a Moonsault but Dunne got out of the way. Dunne stomped on Ricochet’s hand several times but Ricochet responded with a knee to the face and both Superstars fell to the canvas. Dunne hit Ricochet with a forearm to the face and then hit an X-Plex for a two count. Dunne charged at Ricochet but Ricochet got out of the way and booted Dunne out of the ring. Ricochet went for a Moonsault on the outside of the ring but Dunne got out of the way and hit him with an X-Plex on the ring apron. Ricochet hit Dunne a reverse Hurricanrana out of nowhere for another two count. Dunne stomped on Ricochet’s hands once again and then hit him with an Enziguri. Dunne followed it up with a Clothesline but Ricochet shrugged it off and flipped across the ring. Ricochet hit Dunne with an awesome DDT for another near fall as the crowd erupted in an “NXT!” chant. Ricochet made his way up to the top rope and Dunne joined him up there. Ricochet got the upper-hand and hit an awesome Frankensteiner. Ricochet followed it up with a Flatliner and went for the cover but Dunne was somehow able to power out at the last second. Ricochet went for a springboard 450 but landed right into a Triangle submission from Dunne in the middle of the ring. Ricochet broke the hold with a Powerbomb but Dunne once again bent back Ricochet’s fingers. Dunne then locked in an Arm Bar but Ricochet was able to escape by deadlifting Dunne into a Brainbuster. Wow. Undisputed Era rushed down to the ring and attacked Ricochet and Dunne as the crowd booed because the match ended in a DQ. War Raiders came down to the ring for the save and Undisputed Era retreated through the crowd. After the match, the crowd gave a great reaction to Ricochet and Pete Dunne as they got to their feet. 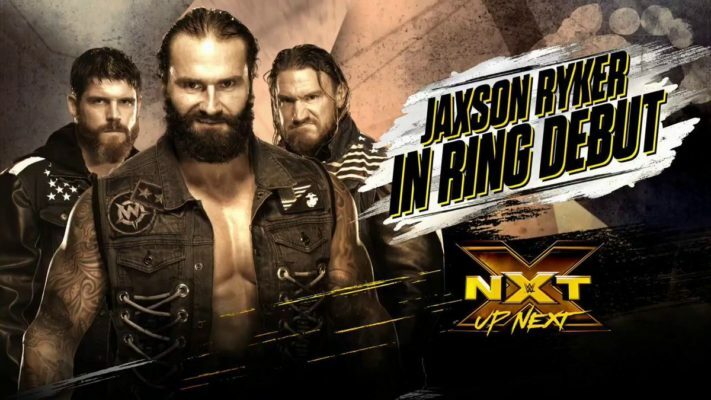 NXT went off the air as the crowd loudly chanted “NXT!” as Dunne and Ricochet stared at each other from opposite sides of the ring.